This is great for lighting the Christmas pudding or for cocktails. You will need to prepare the rum at least two weeks before you plan to give it away. 1 Pour 100ml rum into a small saucepan. Using a small sharp knife, split the vanilla pods down their length, then add to the pan with the cinnamon sticks, star anise, cloves and sugar. Using a vegetable peeler, pare thin strips of peel from the orange and add to the pan. Slowly warm the rum over a low heat, stirring to dissolve the sugar; do not allow it to boil. 2 Pour the contents of the pan into a large, sterilised jar, then add the remaining rum. Once cool, tightly seal the lid and shake vigorously. Leave the rum in a cool, dark place and give it a good shake every day to muddle the spices. 3 After 2 weeks, strain and discard the whole spices and orange peel. 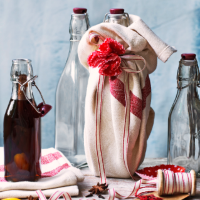 Decant the rum into small new, sterilised bottles (or a larger one, if you prefer) to give to your lucky friends. FYI: The rum can be stored in new, sterilised bottles for up to 3 weeks. Once opened, store in the fridge and use within 1 week.